Rayleigh Mill was chartered in 1996. Since then they have gone on to raise money for a number of local, national and international charities. 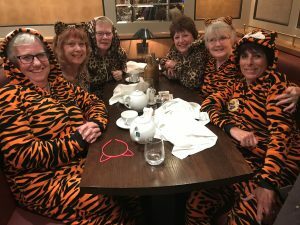 They also arrange social activities such as meal out, theatre trips and have an annual weekend away. 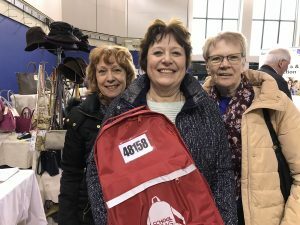 Also they support the Rotary Club of Rayleigh Mill in their events and recently were to be found assisting with registration at the Rotary 10K run. To contact the club email rayleighmill@innerwheeldistrict24.org.uk. 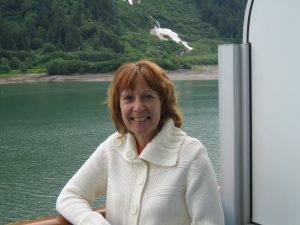 My name is Norma Bowers and I am the current membership contact for the Inner Wheel club of Rayleigh Mill. I have been a member of this club since it was chartered in 1996. Throughout this time, I have met many ladies who have gone on to become very good friends. Our club has a membership of 14, however, we would love to have some new people join us. We meet on the second Tuesday each month at Squires coffee shop in Rayleigh at 8pm where we enjoy a light supper and a glass of wine. We occasionally have a speaker and sometimes these relate to charities that we have elected to support. In addition to our regular meetings we do have social events e.g. theatre trips, meals out etc. 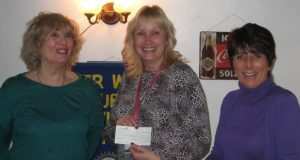 as well as organising events to raise money for local and international charities. I appreciate that it's not easy joining a club where you may not know anyone but my job would be to make that easier and ensure you have any information you may require. As we do have a meal that has to be ordered in advance we do ask that guests let us know if they wish to attend and members give us their apologies for any meetings they are unable to attend. So if you feel you would like to become part of Inner Wheel then please do not hesitate to contact me via our email address rayleighmill@innerwheeldistrict24.org.uk. 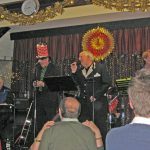 At our February meeting, we were joined by guests Sally Bridger of Havens Hospices and Maggie Summerville representing Wheelz Band. Sally spoke to us about the amazing work of the charity and in particular the work carried out at Little Havens Children's Hospice looking after children with life limiting illnesses as well as respite care for their families. 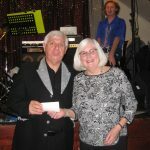 So it was with great pleasure that we were able to present Sally with two cheques for Little Havens Hospice, one from Wheelz Band from their own fund raising efforts and one from the Inner Wheel Club of Rayleigh Mill, the money having been raised at our Christmas party night in December. Our thanks to all those who attended and supported the event. See details below. 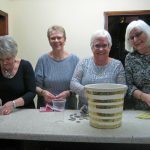 On Saturday 1st December, Rayleigh Mill IW Club held a charity fund raising evening with all proceeds going to Little Havens Hospice. 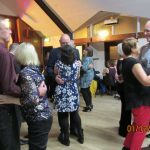 The event was a sell-out with dancing to live band, Wheelz, and a fish and chip supper. 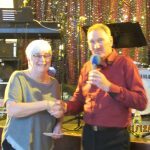 In addition to the money raised by Inner Wheel from ticket sales and a Christmas themed raffle, Wheelz Band, who themselves raise money for charity, presented Vice President, Celia Clark, with their own cheque for £1,000 which will also be presented to Little Havens. Our thanks to Wheelz for a wonderful performance and their support of our chosen charity. Thanks also to all our guests for their generous support. International Inner Wheel has chosen"Caring for Women and Girls" as the new three year social project for 2018-2021. With this in mind Inner Wheel in Great Britain and Ireland has decided to support this project in after hearing the shocking news that in this day and age many women and girls in our own country are unable to afford and access basic sanitary protection. 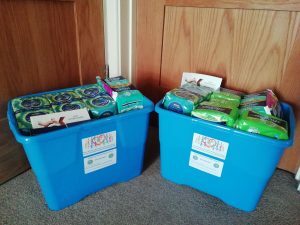 The Inner Wheel Club of Rayleigh Mill has chosen to donate boxes of sanitary products for girls at the two local secondary schools, FitzWimarc and Sweyne Park in Rayleigh. Both schools have been appreciative of the donations and we hope that these products will go some way to giving dignity to young girls in need. 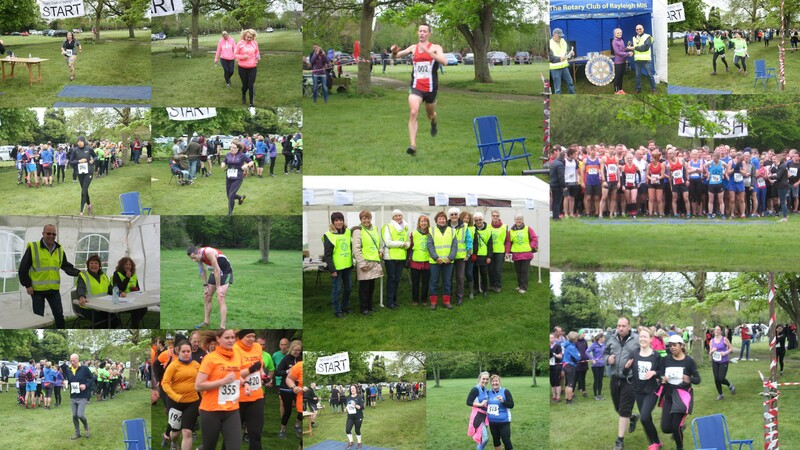 On 29th April Inner Wheel, a really cold and dull day, members or Rayleigh Mill Inner Wheel assisted the Rotary Club of Rayleigh Mill with their 10K run, registering runners and handing out medals and water at the end of the run. Despite the cold weather and the mud the runners were very enthusiastic and a good time was had by all. Our President, Jackie Wellman, chose to support Bosom Pals this year. Bosom Pals is a group offering support to women (and men) who have been diagnosed with breast cancer. Jackie's daughter, Angela, recently underwent treatment for breast cancer and she has found the group a tremendous support during and after her treatment. 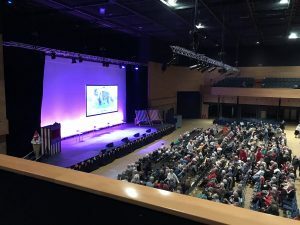 Seven members of the Inner Wheel Club of Rayleigh Mill attended the National Conference in Brighton where we enjoyed listening to speakers from a number of charities supported by Inner Wheel Clubs, as well as fascinating talks from John Benjimin, of Antiques Roadshow fame and Helen Sharman, British Astronaut. 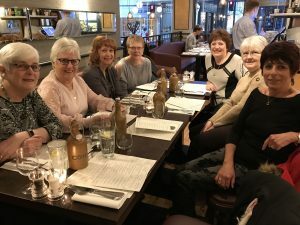 President Jackie Wellman centre with Norma Bowers and Stella Buxton after purchasing a rucksack for "School in a Bag"
Rayleigh Mill ladies enjoying a meal before a fantastic evening listening to the Opera Boys. Kool Katz ready for the final night party. 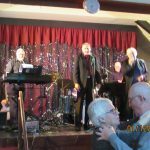 On Saturday 9th December The Inner Wheel Club of Rayleigh Mill hosted a very successful Christmas Party Night, with dancing to live band, Wheelz with a fish and chip supper and Christmas raffle. 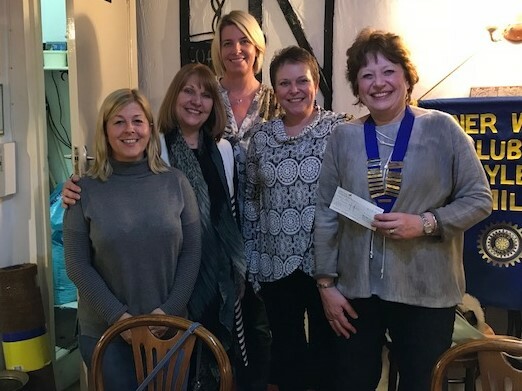 Fun was had by all and the evening raised £1,180 for our President's chosen charity, Bosom Pals, a group which offers support to women and men who have undergone treatment for breast cancer. 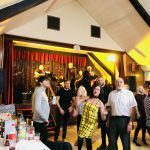 In addition to the money raised from ticket sales and the raffle, Wheelz, who claim to be the Number 1 fund raising band, also donated money they have raised for charities we support, Bosom Pals, Little Havens Hospice and The Amy May Trust. 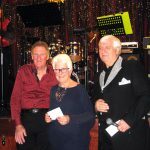 Photos show John Fairweather and Alan Clark presenting a cheque to Gloria Chardin who accepted the cheque on behalf of The Amy May Trust, and Alan Clark presenting District Chairman, Celia Clark with a cheque for Little Havens. 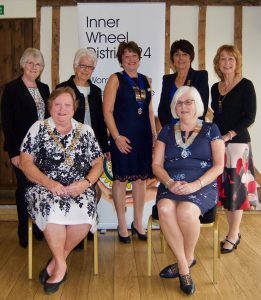 Members of the Inner Wheel Club of Rayleigh Mill were proud hosts of the District Rally at Channels. District Chairman (and member of Rayleigh Mill Club), Celia Clark is pictured alongside Association President, Liz Thomas and members of the Rayleigh Mill Club. Jackie, Wellman, President of Rayleigh Mill, gave an interesting talk on the history of Rayleigh.